Beauty is all around us, including in the sky. 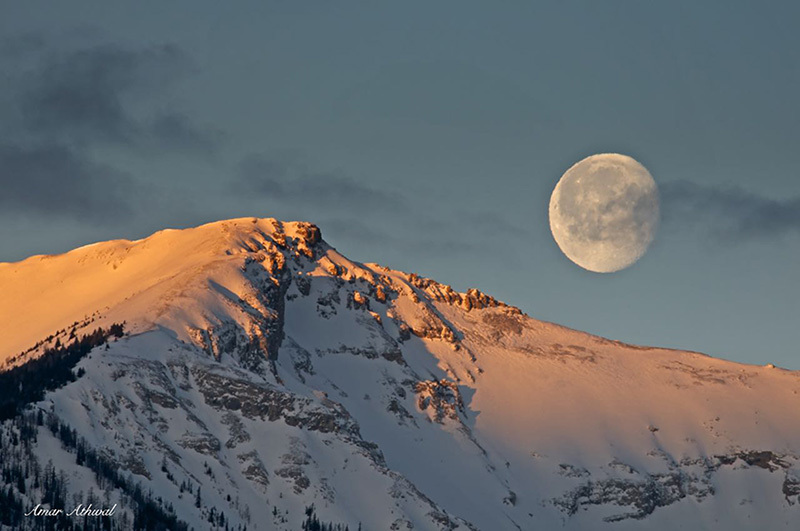 I was driving in Kootenay National Park, looked to my left and saw the moon setting behind a peak. Pulled over, the road was clear of traffic in both directions. Turned around and went to the location which would give me the best picture. Took the picture and off I went. Life would be different if there was no Moon. There would be no eclipses, well Venus does get between the Sun and Earth, but just not the same. The nights would be much darker, we would see more looking up in the night sky. The tides, would be very small with the Sun causing them. With no tides caused by the Moon, there would be no tidal friction, which would mean the Earth would rotate faster. That would provide us with much shorter days, 6 to 8 hours long. The Earth's axial tilt would change greatly, which in turn would have a major effect on weather. With these and other effects on the Earth without the Moon, life would evolve differently. But thankfully we do have the Moon looking after us and can enjoy chocolate on the only planet that it grows on, as far as we know. It was the night before the Full Moon was going to make an appearance. The opportunity was there to take the picture of the moon rising over the mountain. Work was going to play a role taking picture of the Full Moon, so I took full advantage the day before. There's always something to take pictures of, flora, fauna, landscapes, and day and night sky. Lot of options for photographers. Having couple of lens, will looks after most situations for photography. I was out taking pictures of wildlife, returning home I notice the moon over Sundance Range, stopped to the side of the road and took the picture. Few mornings back I was watching the moon as it made its way back of the Massive Range. The Massive mountain range all covered with fresh snow, creating a beautiful winter morning. There was more then enough light on the moon and still mostly clear of the clouds. And just before the moon disappeared behind the clouds, I took the picture. I got this picture as the full moon was rising over Tunnel Mountain yesterday evening. The sky was clear, it was just matter of waiting in the cold for the moon to reach top of the mountain before I could take few pictures, worth the wait. This Monday full moon will be rising, or in this case a supermoon. The difference, a supermoon is when a full moon or a new moon makes its closest approach to Earth on its elliptical orbit. A another additional bonus for this Monday, the Moon will be closest to the Earth since 1948. On November 14 the Moon will be 30 percent brighter and 14 percent bigger than the regular full moon. If you don't live in the mountains, it will even look more impressive when it rises over the horizon, the visual moon effect at its best. For those of us in the mountains, we will have to wait bit longer as it makes its way above the peaks on Monday. The moon setting over Cascade Mtn one cold winter morning. It was a clear blue sky, the mountain covered with snow was lit up by the morning light. For about ten minutes I waited and watched the moon set. Taking pictures when the moon was just about to go behind the mountain. While standing near Lake Minnewanka I looked toward the west and saw the moon setting behind Cascade Mountain. Quickly I got the picture before it was fully set. I was trying to rush to get my pictures of the star trails, knowing the moon would soon be coming over the Fairholme Range. Once the moon made its appearance, I liked the way the landscape looked and the way the snow spread the light, so I continued taking more images until the moon was too high and reflecting too much light. I was not able to take any pictures of the supermoon lunar eclipse because of the clouds, but I was able to get one of the moon the following night rising over Tunnel Mountain. Always looking to take pictures of the Moon and for me a good picture of the Moon include the clouds. In this picture the clouds seem to give the Moon motion, even though the Moon is in motion in space, moving very fast around the Earth. Another picture of the moon, this time it was setting behind Mount Bourgeau. The picture was taken this monring, for a while I though it was not going to come out from behind the cloud. But I did not have to wait long before it was visible , giving me enough time to take few pictures. About a billion years ago the moon was only about 200,000 Kilometers away from earth, instead of the now 384,000 Kilometers. It would have taken the moon 20 days to orbit the earth instead of over 27 days today. The tide would have been much stronger as well and during the full moon phase, you would not have needed sunglasses but the light reflected to the earth would have been immense. The moon's relationship with the earth is in constant change as the moon continues drifting away. Most of us know when the sun will be rising and setting, but very few of us are aware what the moon is up to, other then when it is a full moon. Before I go out I like to know where the moon is in the sky, keeping my options open for photo opportunities with it. I had my eyes on the moon as its was heading for the back of Waputik Range. After taking number of shots, this was the one I liked the most, the moon setting behind Howse Peak. I was headed to Sunshine's parking lot, when I looked toward my left and up, I saw the moon rising. I wanted to take a picture of it, it was just a matter of composition. When I came by Goat's Eye Mountain, I knew I had my picture. The plane was a bonus.